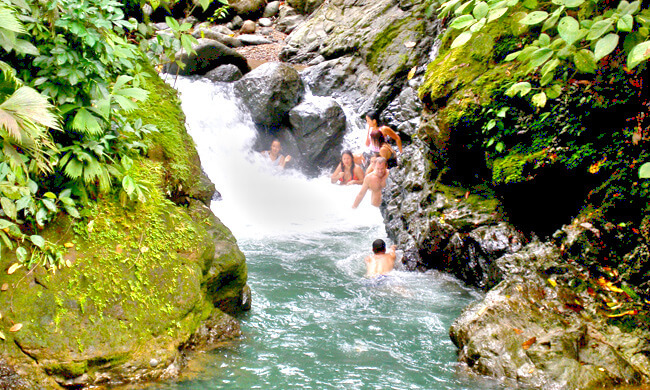 Visit a Revived Rural Community and Swim in a Waterfall! If you really want an authentic Costa Rican experience that includes a visit to a revived rural community, a hike through the rainforest, and a swim in a waterfall, then this is the tour for you! The tour starts as you drive through palm oil farms while your guide explains their historical context and how they affected growth of the region. After a 45-minute drive, you’ll arrive at a beautiful lookout point up in the mountains for a quick break to enjoy some local treats and take in the views of the Pacific below you. You will also make a stop at an authentic sugar mill run by massive, white oxen. Make sure to have your camera ready for these photogenic animals! Next it’s time to experience the untouched tropical rainforest and see some wildlife! The hike is moderate, and it’ll take you an hour and a half to reach the waterfalls. Your guide will share his knowledge of this pristine mountain sanctuary of flora and fauna where rivers are born. Take a refreshing swim in the natural pools—there are stairways and railings to get in, if jumping off a cliff is not your style! Try your luck at the tilapia fish ponds and work up an appetite for lunch! In the early afternoon you will be driven back to the restaurant to end the tour with an traditional Costa Rican meal—’casado’, consisting of chicken, rice, beans, and tortillas. Delicious! This tour is best suited for someone that truly wants to learn about the country they’re visiting while taking in beautiful sights and doing different activities. On top of that, you also contribute to the local community, since the tour guides and cooks are all local residents. At the end of the tour, you’re given a certificate for the planting of a tree in your name to help preserve and reforest the area! What to bring: Hiking shoes, repellent, sunscreen, bathing suit, river sandals, camera, binoculars, extra T-shirt. *Private tour available, stated pricing based on four adults.